Lissa Dragomir is a Moroi princess: a mortal vampire with a rare gift for harnessing the earth's magic. She must be protected at all times from Strigoi; the fiercest vampires--the ones who never die. The powerful blend of human and vampire blood that flows through Rose Hathaway, Lissa's best friend, makes her a Dhampir. Rose is dedicated to a dangerous life of protecting Lissa from Strigoi, who are hell-bent on making Lissa one of them. 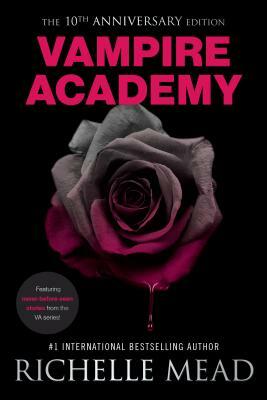 After two years of freedom, Rose and Lissa are caught and dragged back to St. Vladimir’s Academy, where vampire royalty and their guardians-to-be prepare for a life fraught with danger. Rose and Lissa must navigate their treacherous world and never once let their guard down, lest the evil undead make Lissa one of them forever. But soon Rose finds herself gripped by temptation of forbidden love, leaving Lissa exposed to Strigoi attack. Now she must choose between the best friend she lives for, and the man she can't live without…. Richelle Mead is the author of the international #1 bestselling Vampire Academy series, its bestselling spinoff series Bloodlines, the fantasy standalone Soundless, and The Glittering Court. A lifelong reader, Richelle has always had a particular fascination with mythology and folklore. When she can actually tear herself away from books (either reading or writing them), she enjoys bad reality TV, traveling, trying interesting cocktails, and shopping for dresses to wear on tour. She is a self-professed coffee addict, works in her pajamas, and has a passion for all things wacky and humorous. Originally from Michigan, Richelle now lives in Seattle, Washington, where she is hard at work on her next novel. Visit www.RichelleMead.com to find out more.